The 1911-D Indian Head Quarter Eagle is THE key date in this. While still in the conceptualizing stage, the Indian Head Quarter Eagle design found favor with President Theodore Roosevelt. In 1908 it began regular production. The Indian Head Quarter Eagle was unusual in that its main features were incused (i.e. indented into the coin), rather than raised above the surface, as all previous US coins were. Without doubt, the key date is the 1911-D Indian Head Quarter Eagle, having a mintage of only 55,860 pieces. The next scarcest is the 1914, which saw a mintage of 240,117. In 1911, the Denver Mint was preoccupied with the production of the Lincoln Cent for the first time. Other high demand denominations (e.g. the dime) consumed much of the remaining capacity, leaving little time for quarter eagle production. The Indian Head Quarter Eagle was discontinued in 1929. It is one of the few US gold coin sets that a collector has a reasonable expectation of completing. The only really tough coin to acquire is the 1911-D, which explains why it sells for more than 10 times as much as any other member of the group. The 1911-D always has been and always will be the leader of the pack. 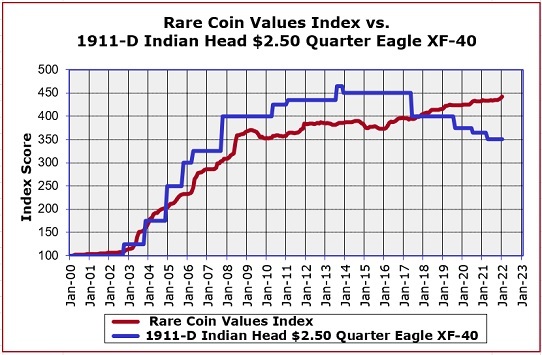 The blue line in the chart above shows the percent increase in retail price of the 1911-D Indian Head Quarter Eagle in XF-40 condition. The red line shows the percent increase of the Rare Coin Values Index, which is comprised of 87 rare United States coins, carefully chosen to represent the spectrum of US numismatics. Both blue line and red line use Year 2000 as a baseline. The 1911-D Quarter Eagle has increased in value a little more than the Index. The 1911-D Quarter Eagle is one of the 87 coins in the Index. All Index data is updated monthly.